Former Chino Hills phenom returning to prep scene for senior season. Youngest Ball brother is a certified point guard prodigy. According to a report by SLAM, LaMelo Ball is returning to high school basketball. SLAM is reporting that Ball is enrolling at the SPIRE Institute (Geneva, Ohio) to play his senior year. More of a training center than traditional high school, SPIRE is not a member of Ohio's OHSAA and operates independently. Michigan State commitment Mark "Rocket" Watts and 7-foot-7 Robert Bobroczky are among other players on the program's roster. Even as an independent program, it's unclear how this all works out. Ball played professionally in Lithuania last winter as well as in his father's JBA. He's also been a walking billboard for the Ball family's Big Baller Brand. It's seems likely that some opponents will balk at the idea of competing against Ball. GEICO Nationals hopefuls like La Lumiere (LaPorte, Ind.) and St. Benedict's Prep (Newark, N.J.) are both on the schedule in November and may not want a blemish on their resume against a team with a professional on the roster. Here's hoping this all works out because LaMelo is one of the most entertaining players to come along in recent years and a legitimate potential NBA talent. As a sophomore at Chino Hills, Ball averaged nearly 27 points and 10 assists per game and famously authored a 92-point performance. 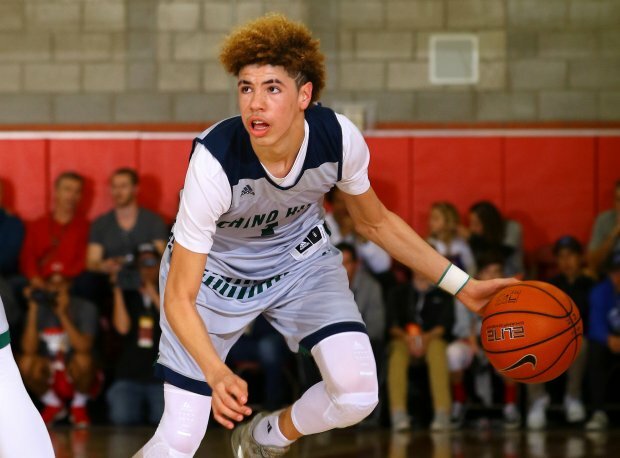 LaMelo Ball last played high school basketball as a sophomore at Chino Hills in Southern California.